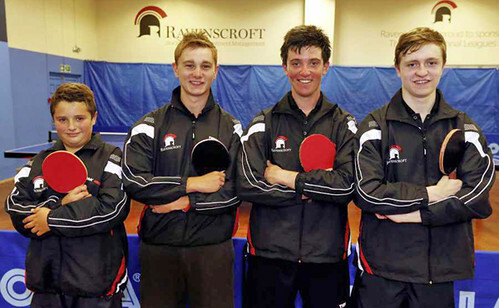 RAVENSCROFT I finished their British National League campaign off in style this weekend and secured promotion from Division Four North. TTC and Rotherham Scorpions II. the only game of the encounter. Ben Foss also came through the match unbeaten. Robinson and Foss chipped in with two wins, but Stacey was defeated in straight games by David Eden, having started with a straight-game win over Mark Bleakley. whitewash over North Ayrshire in the penultimate match. loss to Foss, 14-12 the score in the final end. The final match resulted in a 6-2 win over venue hosts, Halton TIC IV. Butler had dropped his first end of the weekend during a fourgame win over Andrew Macpherson, but he was back to top form in this fixture with straight-game win numbers six and seven of the weekend. both of his singles matches in straight games. Foss beat Jordan Mcgarry in four, but was defeated by Eckl in straight games. and debutant James Rabey found the going tough during the final weekend of fixtures in the fiercely contested Division Four South.